Amenity There are 10 products. A cup holder and a tablet table are attached to the back-side of back-rest for the user on the back-side, but can be folded and fixed when not in use. Arm-rests with urethane pads keep users’ convenient posture further. 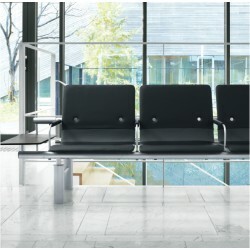 Height adjustment adjuster enables lobby chairs to be adjusted horizontality even on an uneven floor easily.